Designed by renowned architect Moshe Safdie, the building’s most distinctive features are the Muriel McBrien Kauffman Theatre, Helzberg Hall, Brandmeyer Great Hall, its acoustical design and accessibility. Each space contains dramatic eye- and ear- catching design that combines sophisticated aesthetics, acoustics and technology with the intimacy of a smaller space and the comforts of home. 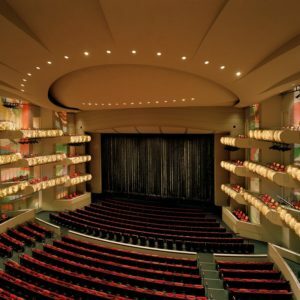 The Kauffman Center’s 1,600-seat Helzberg Hall hosts a variety of local, regional, national and international artists and performance groups, including serving as the performance home of the Kansas City Symphony. 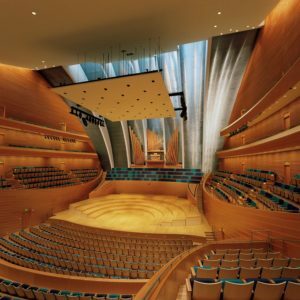 This video features the Kauffman Center’s two venues, Helzberg Hall and Muriel Kauffman Theatre, and the facility’s primary lobby space, Brandmeyer Great Hall. Drone footage provided by NMG Studios.